Learn the best practices on how to quickly leverage modern integration technology to stay relevant and ahead of the competition. The explosion in the volume, variety, and velocity of data has created even more urgency for companies to meet the demands of today’s data-driven economy. Traditional integration approaches are just not cutting it. Legacy solutions are too slow and cumbersome, in-house teams lack necessary programming skills, and point solutions don’t scale. Join us March 28th to learn from success stories of leading cloud file sharing company Box, a top management consultancy, a preeminent SaaS application provider, and more. We will share actionable insights on how these companies automate their application and data integrations to enable data-driven decision-making, streamline business processes, and slash technology debt. Walk away with a checklist of practical steps to overcome your major integration pain points and speed up your integration projects. Compare the pain of building app and data integrations in-house to the measurable benefits of modern enterprise integration software. The need to integrate applications, APIs, and data is growing dramatically. In many cases, IT professionals address these challenges through manual coding. Hand-coded integrations not only take weeks or months to build, but they also consume big chunks of time for ongoing maintenance. Modern integration platform as a service (iPaaS) solutions offer a better alternative to hand-coding. But measuring the return on investment (ROI) of these solutions is notoriously difficult. And how can you justify purchasing an iPaaS if you can't quantify its value in dollars and cents? In this webinar, speakers Habib Hussain, Manager of Financial Systems at Groupon, Hyoun Park, Founder and Chief Analyst at Amalgam Insights, a leading research and advisory firm, and Craig Stewart, SVP Product at SnapLogic, will demystify the process of measuring the numeric value of a modern integration platform. 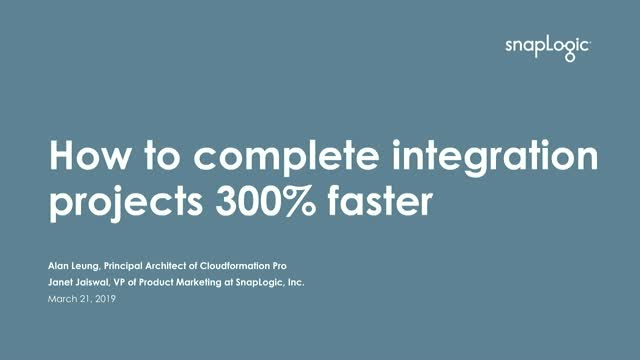 SnapLogic provides the #1 intelligent integration platform. Our mission is to make it fast and easy for users to access, connect, manage, and analyze enterprise data to improve business processes, accelerate decision-making, and drive better business outcomes. The company’s leadership in intelligence-powered workflows and self-service integration capabilities make it fast and easy for organizations to manage all their application integration, data integration, and data engineering projects on a single, scalable platform. Hundreds of Global 2000 customers – including Adobe, AstraZeneca, Box, GameStop, Verizon, and Wendy’s – rely on SnapLogic to automate business processes, accelerate analytics, and drive digital transformation. SnapLogic was founded by data industry veteran Gaurav Dhillon and is backed by blue-chip investors including Andreessen Horowitz, Capital One, Ignition Partners, Microsoft, Triangle Peak Partners, and Vitruvian Partners.